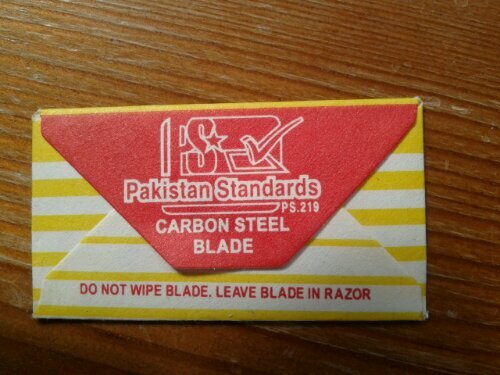 This blade, manufacturer in Pakistan, was part of a selection pack I bought of eBay. It looked promising, and started off OK, but on the very first shave I could feel the edge fading away from almost the start. By the end of the save it was like a 3 day old razor – and I don’t consider that I have particularly heavy stubble. This is one to avoid in future. 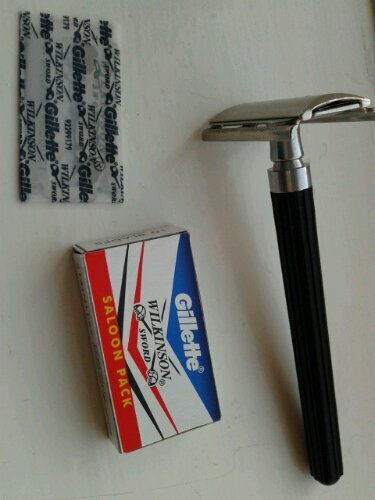 I bought ten blades and the razor from eBay for £5. The first shave was pretty good, a little rough maybe, but worth continuing with. 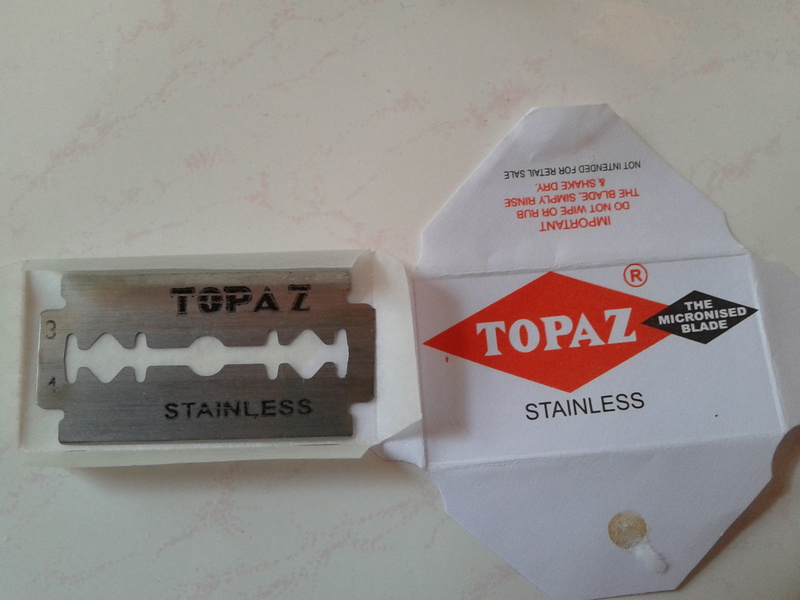 The razor, though very similar to I had given up on, holds the blade at at good angle and is easy to use. 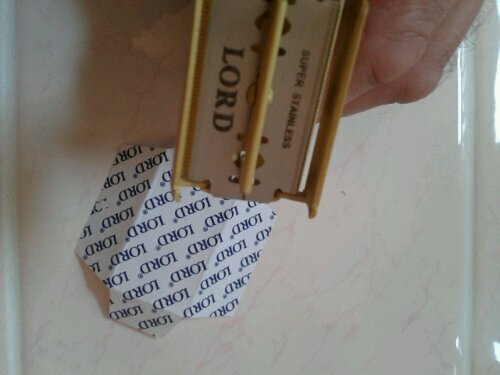 For £5 including the blades, I don’t feel cheated! Sorry, I don’t know anything about this blade, but I can tell you that it was rough! I shaved once with it, and didn’t want to shave a second time using it. Another blade from the multi-pack I bought. Got two shaves out of it by turning the blade over. Gave up on the third shave! Really not recommended. And yes, the photo is upside down! This blade claims to be Micronised, which means “To reduce to particles that are only a few microns in diameter.” Sounds promising! They obviously spent more time on the cutting edge than on the printing, which is fairly poor. Still, the blade is double-wrapped, which is usually a good sign. This blade is from India, and a quick Google search reveals that it is not one of their top-end blades. Update: Smooth shave but I’m not convinced it will last more than a couple of days. We’ll see. Update: Today’s shave was terrible. No cuts, but really rough, and left my face sore. Normally I find day 2 to be the best day for a blade, today I nearly gave up half-way through the shave (and I kind of wish I had). Going back to a trusted Dorco blade for a few days to let my face recover. 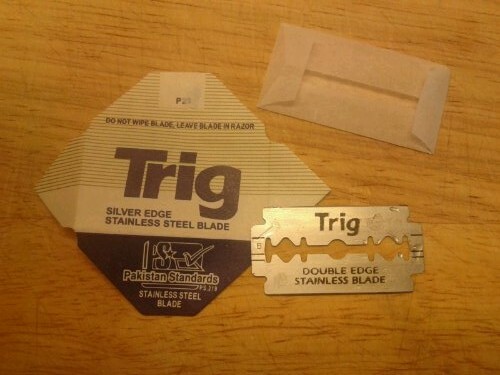 Won’t be buying these blades any time soon! This seems to be a basic Lord blade. The blade is single wrapped, which I guess is sufficient, but most of the better blades are double-wrapped. 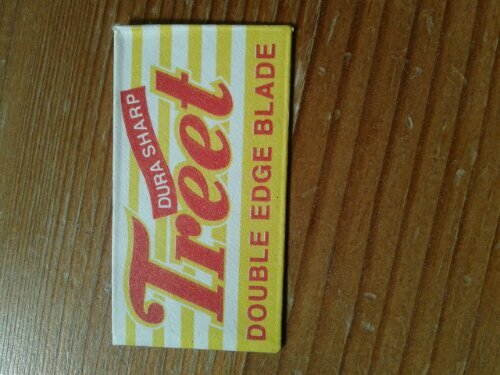 Their more up-market blades are very good, let’s see how I get on with this one. Update: I shaved 4 times with this blade. Shaves 2 and 3 were definitely the best. During the 4th shave you could feel the blade fading away. 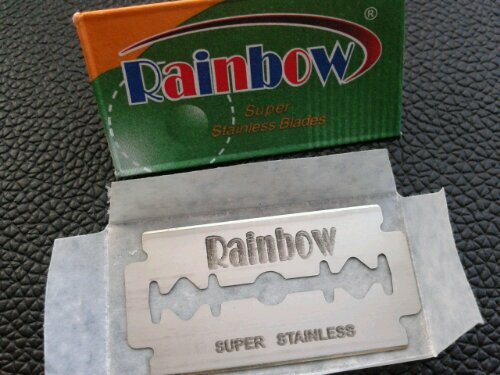 Compared to the Lord ‘Cool’ Super Stainless, it was definitely an inferior blade. Not a bad blade, but wouldn’t be my first choice. 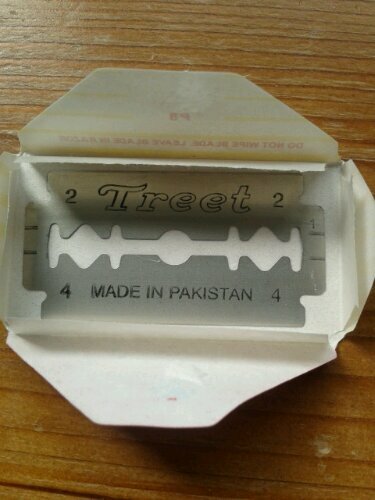 Today’s blade comes from Pakistan. 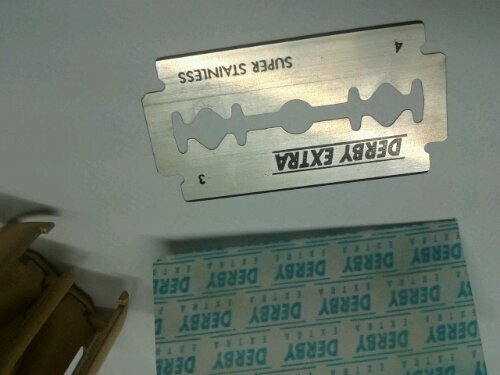 The printing on the blade isn’t very precise, and the inner wrapper is of lower grade paper than other blades I have tested. We’ll see how it gets on. Update: Day 1 – actually a really good shave. Very happy with my first impression of this blade. Update: Day 2 – really good shave today, this is a very good blade. Update: Day 3, the shave started ok, but half way through it started pulling, it had gone blunt. Finished the shave, but not going for a day 4. A disappointing end to a blade that showed promise at the start.